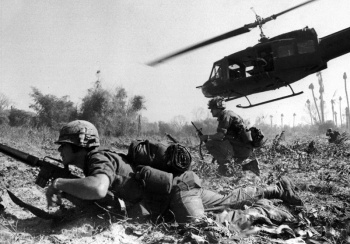 Rumors that Treyarch's next Call of Duty will be set in 'Nam now have more ammunition, as a casting call for "voice over/motion capture" describes characters from an elite Vietnam War unit. There have been rumors and rumors aplenty that Treyarch's next Call of Duty would be set in the sweltering jungles of the Vietnam War, from Noah Heller's claim that the company was moving away from World War II and Activision licensing "Cold War era" music, to the developer looking for history buffs to develop the game, to a source outright saying: yeah, it's going to be a Vietnam War game from Treyarch next November. Well, now we have more rumors to toss on the fire: A casting call picked up by VG247 indicates that at least part of the cast of the new Activision-published title will be members of a Military Assistance Command, Vietnam - Studies and Observations Group unit. SOG, a multi-service organization was responsible for undercover operations in Vietnam and operated from 1964 to 1972. The characters mentioned are team leader and WW2 veteran Frank Barnes, a patriotic man, though one "increasingly out of step with the rapidly changing world around him"; Joseph Lewis, a soft-spoken young black man from New Orleans, tactician and mission coordinator Jason Hudson, and Kristina Ivanova, a Russian-born CIA agent who excels in close-quarter combat. Sounds interesting enough, though it does beg the question - if the SOG team is one part of the story, then what will comprise the other half of the Call of Duty series' traditional two-viewpoint campaign? I'd like to think that we'll be seeing somewhere other than 'Nam, myself. As always, these are unconfirmed rumors, so don't go taking them as the gospel truth. But the circumstantial evidence just keeps piling higher and higher, doesn't it?